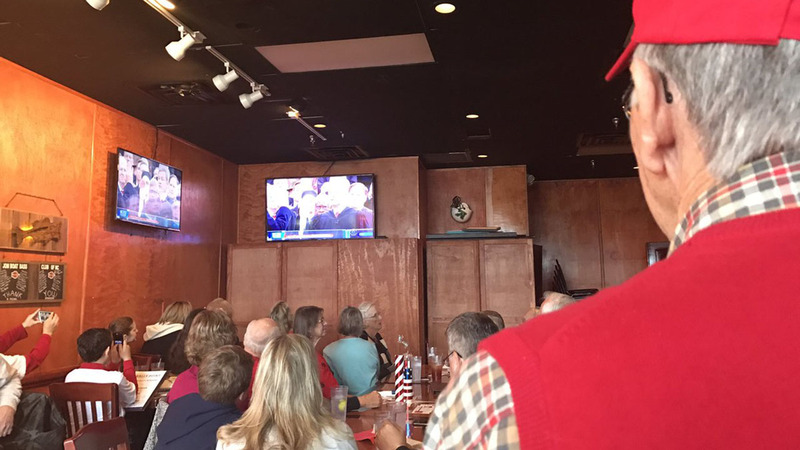 CARY, North Carolina (WTVD) -- Members of the Western Wake County Republicans club meet Friday morning at the Rally Point Sports Grill in Cary to watch Donald J. Trump take the oath of office as the 45th president of the United States. Applause rang out in the Cary sports bar as multiple televisions brought the presidential inauguration to about 80 onlookers. "We are celebrating together," said Renee Miller, president of the Western Wake County Republicans club. "I do really believe that we are united together and we are so excited to see Mr. Trump inaugurated today." Residents of Wake County, members of the Western Wake County Republicans Club, and even local politicians were in attendance. "This is the day where we have peaceful transition of power in the United States," Rep. Chris Malone (R) of Wake County said. "I think that's a fantastic example for the rest of the world to see." Trump supporter Dennis Berwyn proudly displayed a "Make American Great Again" ball cap, saying he went to the Cary bar to relax with friends and enjoy the GOP's victory. "It's a great example to the rest of the world that people with serious differences can come together at the end of the day and have a peaceful transition of power," Berwyn shared. "Beats the heck out of war any day." What does the Oath of Office say?